Access Church is excited to announce the newest addition to our staff! Brian Reese will be serving in the role of Student Pastor, working to lead middle- and high-school students into growing relationships with Jesus Christ. Brian will start in January. Brian and his fiancé, Jamie, are both from Sarasota, Florida and are excited about the move to Jacksonville. 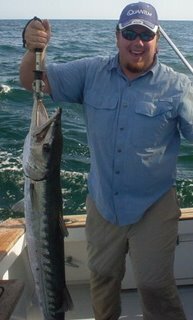 Brian is an avid fisherman and outdoorsman, as well as an active musician. In fact, Brian first became aware of the North Point model of ministry through his college roommate and fellow musician, Kristian Stanfill. Growing up in Venice, Florida (the shark tooth capital of the world), Brian has worked with students at two churches prior to joining our team at Access Church. He has led everything from programming and production to small group environments. It will be with small group environments that Brian will initially focus his efforts at Access, in addition to building a team of volunteer adults willing to whole-heartedly invest in students. Brian and Jamie expect to be married in February. Welcome aboard Brian and Jamie! We are excited to have you guys join the Access team. What an exciting destination on the Access RoadMap. See you in January. Glad you guys are coming. Welcome to the "world's best little big city". Jamie will love the alligator farm- Its very romantic.